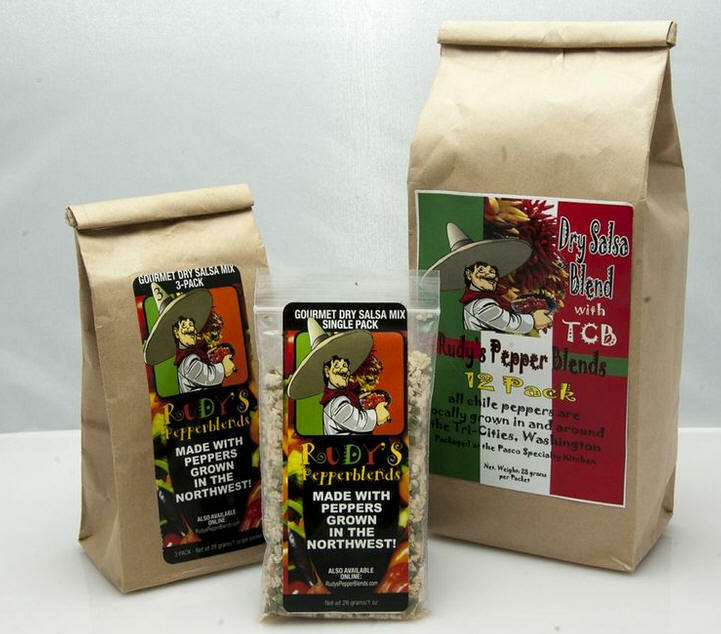 To order pepper blends, salsa mix or meat rubs, enter the number of quantity desired and then proceed to the confirmation page by clicking the button at the bottom of this form. Our flagship pepper blend with a twist - smokey chipotle! Medium heat and lots of flavor from 30 kinds of peppers, medium heat; sprinkle it on your eggs, hamburger and fries, just about anything. 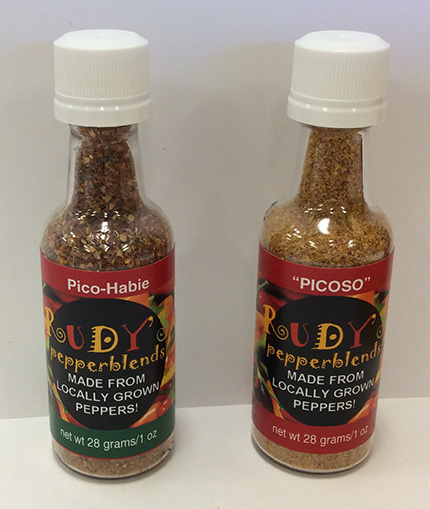 Introducing the hottest Pepperblend available, PICOSO, made with some of the Hotest chili peppers grown locally, Carolina reapers, Trinidad Scorpions and a few others hot pepper added in for flavor. Also Pico-Habie, half Habanero, half PICOSO, spice up your life! TRY RUDY’S FIRST PLACE FIERY FOOD FEST WINNER! An award winning salsa mix with authentic Mexican blends of spices. Just add 1 can of petite diced tomatoes with 1 package salsa mix. Add pepperblends (in small bag included with mix) to desired heat and . . . TA! DA! You have award winning salsa to serve to your guests. 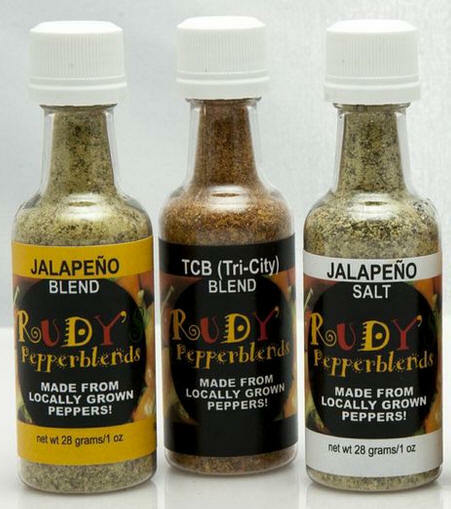 ENHANCE YOUR MEAL WITH RUDY’S SAVORY BLENDS! 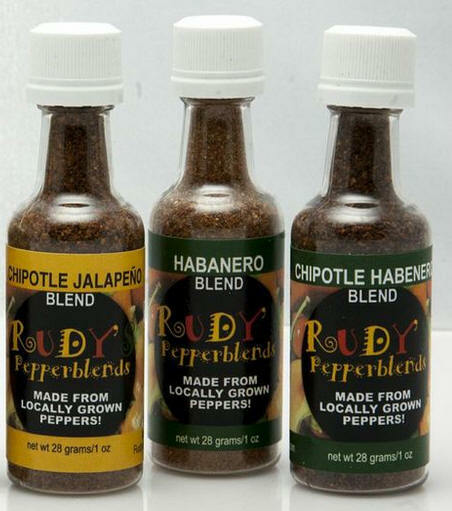 Rudy’s Pepperblends – 1 oz. 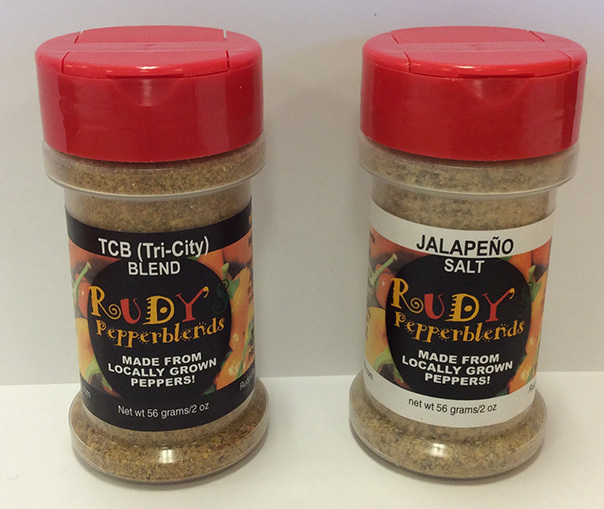 Bottles $6.00 ea., 2 oz Big TCB & Jalapeño Salt Bottles $11.00 ea. Chipotle Jalapeno – Medium heat and super taste . . . We smoke the peppers then process them - $7.00 ea. Chipotle Habanero – Hot, but oh, so good! A unique blend of smoked Habanero and Scotch Bonnet peppers - $9.00 ea. Rudy’s Meat Rubs – 2 oz. Bottles $6.00 ea. Confirmation page will come up after you click Proceed button.